The small print takes it away. There will something resembling a recipe on this page – but first I have a confession to make. I am a label reader. (There. I said it). Guess what? There are a whole lot of labels out there that try to get away with not telling the whole story – but they can’t get away with it, because of regulations. As far as I’m concerned, that’s good, because it gives me the tools to make informed choices. Here’s a nice example of what I consider less-than-fully-honest labeling. Technically, everything on the label of this product is true. “No added sugar“, it starts. “Strawberry flavour“, it goes on. By the time I get this far, my Common Sense is tingling (it’s like a super power), and I’m wondering what gluten has to do at all with jelly, and whether I should buy asbestos-free jelly instead. Time to dig deeper and read the actual list of ingredients. Ingredients lists are heavily regulated. Regulations differ slightly from one country to another, but typically all ingredients must be listed, sorted descending by order of weight. As of February 2000, in the UK, if certain ingredients are considered key ingredients, percentages should be listed. Let’s have a look? Contains a source of Phenylalanine. Contains naturally occurring sugars. Nothing too shocking in that list – Just plain old H2O, some flavourings, and a bunch of approved food additives colloquially known as E410, E415, E418, E330, E120, E163, E332, E951, E950. The phenylalanine is probably there due to the aspartame and my best guess is that the claim “naturally occurring sugars” refers to the thickening agents, which are technically polysaccharides – complex sugars. Molecular gastronomy is here! I know what you’re thinking: Yum. There are no percentages of anything in the ingredients list. 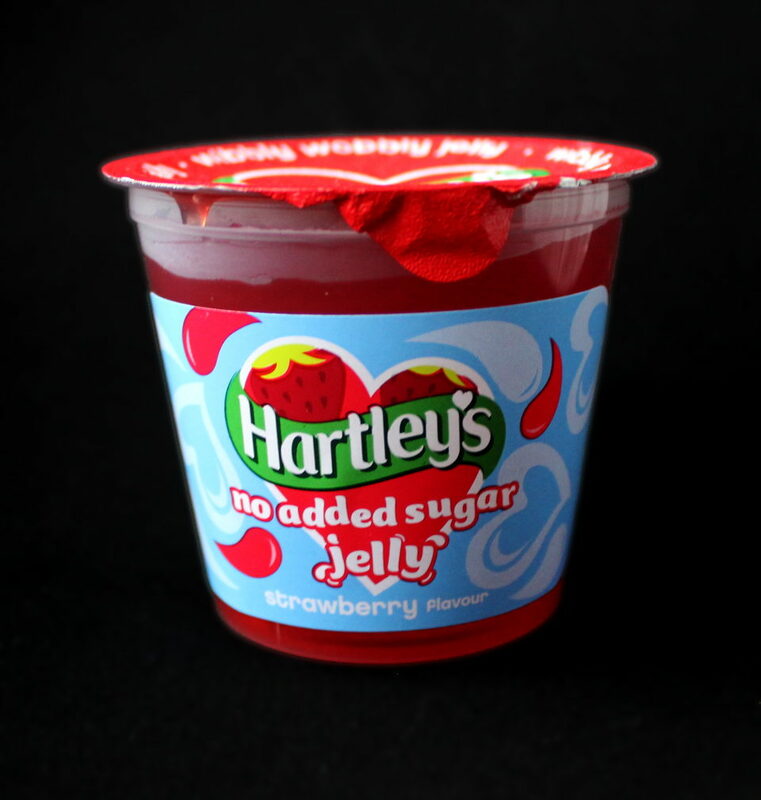 By regulations, the best they could have done was say “Strawberry: 0%” but oops – it fell right off the bottom of the ingredients list because no strawberries were harmed in the making of this jelly. But we can make educated guesses, starting near the top of the list. Some of our guesses can be based on regulation which prescribes the maximum allowed levels of food additives. This will provide different results from one country to another, depending on which regulation is in effect; In this case, as the product is being sold in the UK, the European rules apply, and these state quantum statis as maximum level for Locust bean gum; in other words, “as much as needed, but no more”. The next question then, is “how much is needed?” The regulation that applies in the United States, in this case, is more explicit on the maximum level Carob/Locust bean gum: it sets a maximum use level of 0.75% for jams, jellies and gelatins, but in practice 0.25% is typical. By these guesstimates, this jelly consists of around 97.5% water. I’m willing to go as low as 90%, but that’s probably pushing it. In fact I could go a bit higher because the E-numbers are there in decreasing amounts. In any case, “the upper 90% range” should be a reasonable ballpark figure (I’ve just reasoned it, right?). But water isn’t a bad thing to consume. And so, we’re left with a jelly that contains no useful nutrients, with the possible exception of the potassium citrate, which might help prevent kidney stones, which is clearly something every child should worry about. Looking at the label, I can’t help but think I could be good at marketing. I’d have added more tick boxes: ✓Naturally re-hydrates the body. ✓Contains electrolytes. And I’m not sure if there’s a ten E-number limit or a rule against nutrients, but not having E300 in there clearly is a missed opportunity. ✓A Good Source Of Vitamin C is worth having on the label. Just like those strawberries on there. I like strawberries. And I think there should be more tractors and cows on the label. Everybody loves tractors and cows. That’s actually a good point. I guess I’ll have to leave marketing to the experts. 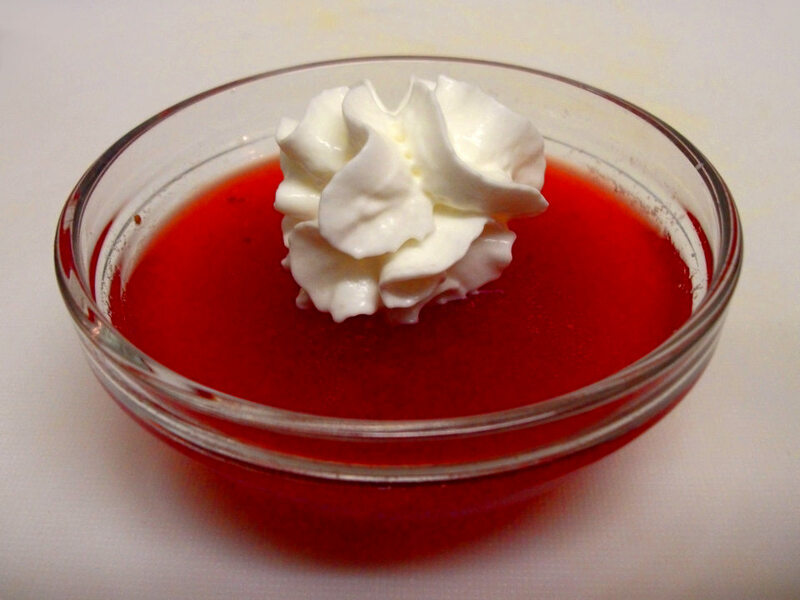 When it comes to strawberry jelly, we might ask ourselves, “Can we do better?”. The answer is a resounding Yes, we can! There will be setbacks. And false starts. There will be many who will disagree with some of the choices I make – I can’t solve every problem. But I will listen to you, especially when we disagree. Hm, that all sounds strangely familiar. Less talk, more cooking. What I’m giving here is more of a general method than a precise recipe, you’re free to adapt it to your needs. First, let’s break out our not-so-secret ingredient. Actual strawberries are a must for a strawberry flavour jelly. If you want the flavour to actually resemble that of strawberries, anyway. As you may be able to see, some of these are a bit bruised – when you buy them by the box, you don’t usually get to pick and choose them one-by-one. The bruised bits can be cut off, or the entire berry can be discarded. If you see a box of strawberries and a few of them are bruised, that usually means that most of the box is at least ripe. And just smell those beauties! Give them a wash, get rid of the greens and slice them up. We’ll pop these strawberries in a saucepan (ideally stainless steel) and macerate them. What that means is that we’ll sprinkle them with a moisture-loving sweetening agent of our choice. For most of you, that would be plain old granulated sugar, but in the twisting kitchen, your food should adapt to you. If you’re vegan, you’d likely use unrefined cane sugar. If you’re worried about your teeth, use Xylitol. It also happens to be a known laxative, so use moderately until your body has adjusted to it. If you’re about best flavour, use fructose. This would be my personal choice. Low cal? Stevia might do it for you. Soon you’ll see a pool of brightly-coloured strawberry juice forming at the bottom of your pan. Feel free to add a bit of water and apply a bit of heat now. Should you not have a stainless steel saucepan but you do have a Pyrex jug and a microwave, that’ll work too. Once you’re happy that you won’t be getting much more juice out of the strawberries, strain and reserve the juice. And if you don’t like strawberries, use raspberries. Or blackberries. 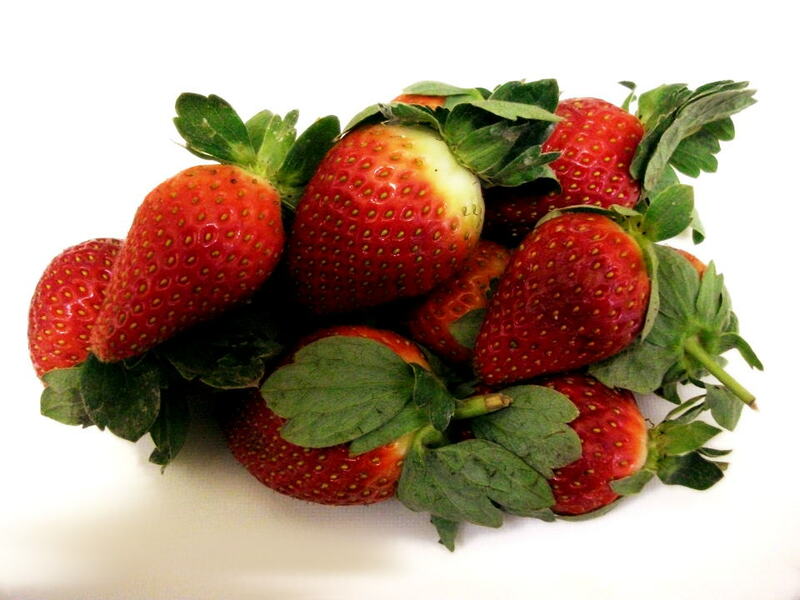 Or fruits that aren’t technically berries but that would taste nice in a jelly – strawberries come to mind. Look at that colour. Clearly, there’s no need to add any food colouring to this stuff – neither plant-based anthocyanins nor bug-derived carmine. That’s good news for any of us who are veggie, have religious objections to eating bugs or those of you who are simply grossed out by that idea. 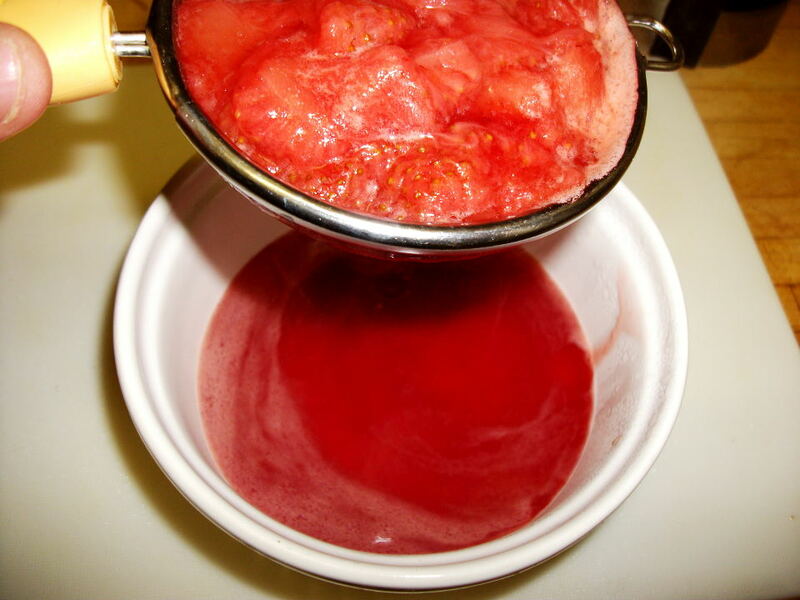 The resulting macerated, sweetened fruit juice is a great starting point for a number of preparations. You can add water and have it as a drink. You can reduce it into a syrup to pour over ice cream. But today, we’ll make jelly. And that doesn’t take much work. In my case I’d break out the agar powder as my gelling agent of choice; you might choose gelatin, or vege-gel, or any other gelling agent that strikes your fancy. You might even use a combination of E410, E415 and E418. Once you’ve chosen your gelling agent, warm up the juice, dissolve the right amount of your chosen gelling agent (as per the instructions on the packet), then leave to cool and set in an appropriate container. I won’t argue that it is more work than buying a ready-made strawberry jelly. But it’s not just any strawberry jelly. The point is that this is a strawberry jelly tailored to your specific needs or demands. It can be veggie. It can be low GI. It will most certainly be Gluten Free (what was that label on about, anyway?). It can even be reasonably healthy. Compared to a jelly that’s optimized for the lowest possible mass-production cost, most importantly, ours will simply taste better. Wash the fruit. 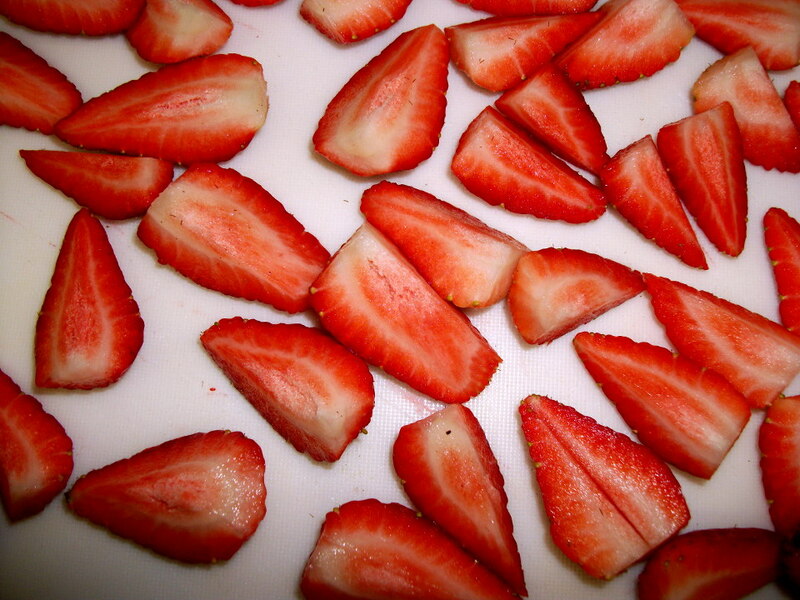 Remove the greens and cut the strawberries in pieces. Place the strawberries in a stainless steel sauce pan. Sprinkle over half the fructose. Stir and leave to macerate cold; A syrup will start to form at the bottom of the pan. Add the water and bring to a boil. 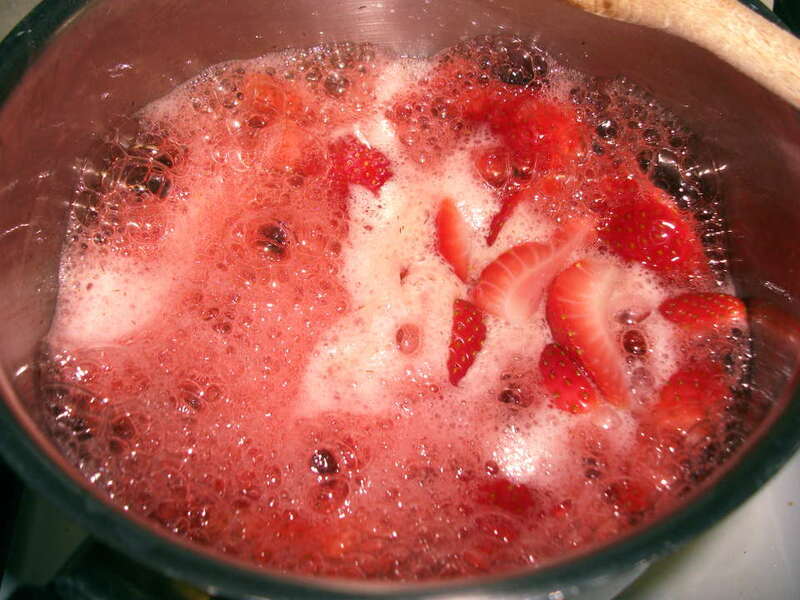 With a wooden spoon, smash the strawberries to the side of the pan until they are simmering in their own juice. Pour the syrup through a sieve, leaving the pulp behind and rendering about 150ml of syrup. Taste it and adjust the sweetness as needed. Pour the syrup back into the (rinsed) saucepan and add the agar powder. While stirring, bring back to a boil. Place the syrup into a jelly mould (two if you make small servings) and leave to set in the refrigerator.